SACRAMENTO, Calif. (December 19, 2018) — Sacramento Republic FC announced today the club’s schedule for the 2019 USL Championship regular season. Republic FC will kick off their sixth league campaign on March 9 with a home match against Real Monarchs SLC. The 2019 season will see the club play 34 matches across 33 weeks, including 17 home games at Papa Murphy’s Park. 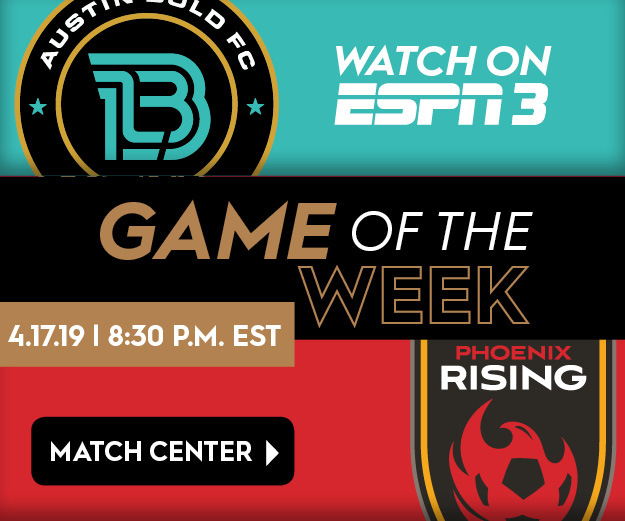 Notable home matchups on the schedule include visits from league newcomers Austin Bold FC on April 6, regional rivals Reno 1868 FC on May 11 and Fresno FC on July 3, Eric Wynalda’s Las Vegas Lights FC on Aug. 10 and longtime foes LA Galaxy II on Oct. 2. Other notable dates on the schedule include two home matches during the California State Fair in July. Republic FC will host Portland Timbers 2 on July 13 and first-year New Mexico United on July 24. All fans with tickets to these matches will receive complimentary entrance to the State Fair on the corresponding matchday. The 2019 season will also be the first time Republic FC host two Sunday afternoon games during the regular season. The club will take on OKC Energy FC on March 24 and Rio Grande Valley FC Toros on September 15. Republic FC will conclude the regular season on October 19 with a visit to Rio Tinto Stadium to face Real Monarchs SLC. Republic FC’s season opener on March 9 will be just the second time in club history that the team starts its season at home. Republic FC currently hold a 4-1-0 (W-L-D) all-time record in home openers and have lost just once across all of their season openers since the club’s inaugural match in 2014 (3-1-1). 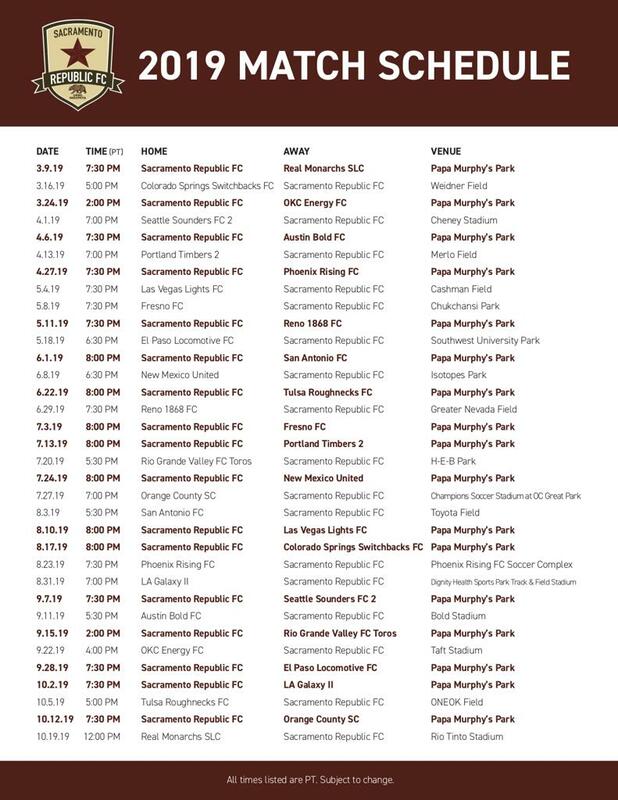 The full 2019 season schedule is available at SacRepublicFC.com/club-schedule and below. A television and radio schedule will be announced at a later date. Tickets are now on sale for groups of 10 or more and may be secured by calling (916) 307-6100 or visiting SacRepublicFC.com/tickets. Deposits are also now open for the priority list on half-season plans. Fans are encouraged to sign up for early access to single match tickets via SacRepublicFC.com.